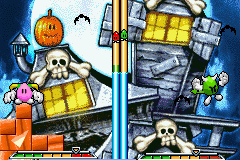 Play Eggo Mania online with Game Boy Advance browser emulation for free! 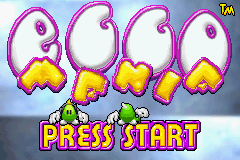 Eggo Mania (GBA) game rom is loaded with features in our flash, java and rgr plugin emulators. Nothing to configure, we've done it for you! To unlock Yolkohama, complete Bomb Mode on Hard Difficulty. 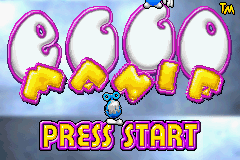 Egg Mania is a Puzzle game, developed by HotGen and published by Kemco, which was released in 2002. 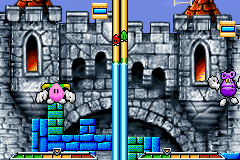 Egg Mania is a puzzle game in which the player controls an egg shaped character against either a computer opponent or another player via the link cable. 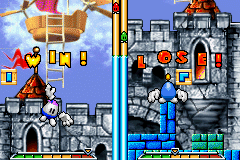 The object of the game is to build a tower tall enough to reach a balloon at the top of the play field before the opponent does. If the player tries to take a short cut and not build complete floors, the water will come up faster. 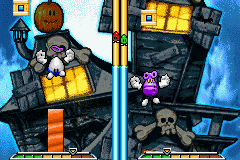 There are plenty of obstacles, both from the game and from competing opponents.